It has one main HUD that governs most of the head’s main features. I appreciate I don’t need 3 HUDs to do basic things. It doesn’t look as slick as others but it gets the job done. 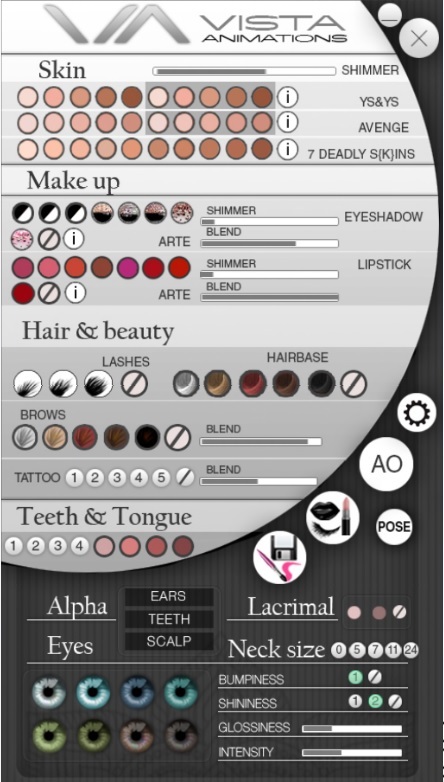 Lida comes with three pre-installed skins from quality creators YSYS, Avenge and 7 Deadly Skins. It also comes with lots of shape options supplied by each skin maker and by Vista. I used one of the shapes to quickly customize my own, which I like but don’t yet love. I will continue to work on it. It has a simple, responsive design and isn’t so stylized that it will look the same on every person with a different shape. In fact, I see this as a head that really takes a bigger step forward in looking truly unique while wearing mesh heads. 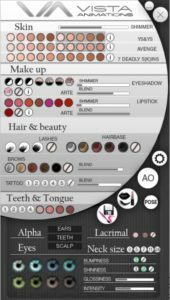 The makeups are pre-installed from ARTE, which is one of my favorites on the grid, and can be toned up or down based on your preference. The eyes need their own AO that compliments the head/mouth animations. They don’t move naturally/realistically IMO and I found it difficult to even maneuver them satisfactorily for snapshots using the basic controls. The animations overall aren’t my favorite and don’t seem very natural despite Vista’s great work on their hands, for example. I feel similarly about most mesh heads other than LeLutka, so this is clearly something I feel strongly about and greatly affects my general use of any mesh head. It’s also completely subjective and you may love these animations! The lipsticks don’t fit as well as they should. Even given differences in shapes, the basic lipsticks should really fit much better than they do. We needed a new entrant into the Bento mesh head market, IMO. And since this head is Omega-enabled, you can use any Omega skin on it that you already have. With the success of their popular Bento hands, Vista has a chance to be a real contender for Bento lovers who want to branch out from Catwa or LeLutka, or just add to their head “menagerie” to change things up from time-to-time like me. This head is priced to sell and I would expect it to be a popular option. It’s also a strong first offering that will likely get some upgrades in the future. I’m excited to see more – on this head and presumably others that will come later. You can find Lia at the Vista main store and I hope you will try her!